For many residents of the Twin Cities, driving up to the Great Lakes is a good weekend getaway. It takes only 3 hours to get to Duluth and the shores of Lake Superior. We drove a little further northeast this time to Hancock, Michigan, a 7-hour journey from home. The drive was very pleasant and weather was great. We had a lovely time. Hancock is situated on the Keweenaw Peninsula, separated from the rest of Upper Michigan by Portage Lake. 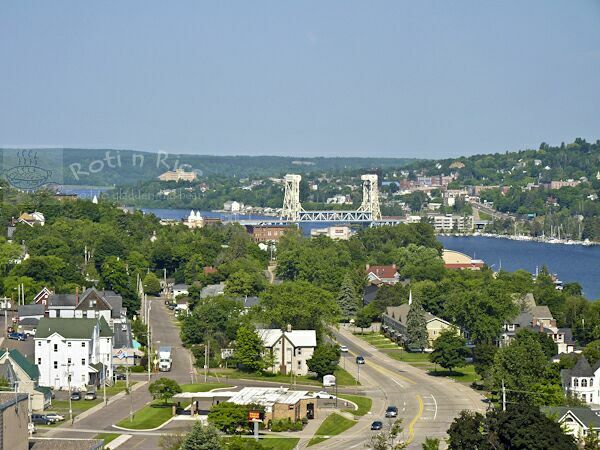 A double-decked vertical lift bridge joins the city to Houghton in the south. The view from here is truly scenic. Looking at this right now, it is hard to believe they had over 300 inches of snow this past winter! One of the highlights of visiting Lake Superior is the opportunity to eat fresh water fish. The deep cold waters are an abundant source of whitefish, trout, walleye, pike, and many other species. They are said to have a firmer and finer texture. 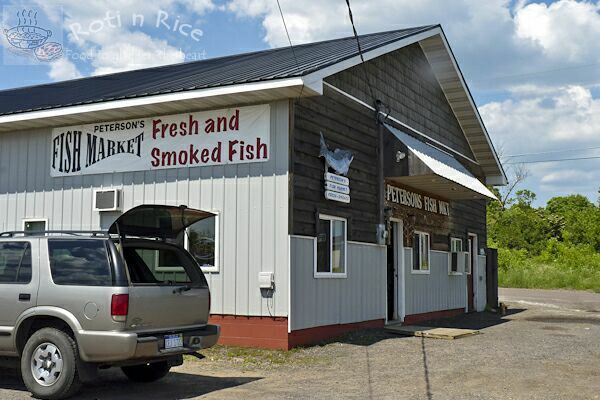 Family owned fish markets like Peterson’s offers a variety of fresh and smoked fish at very reasonable prices. They also serve chowders, baked, and fried fish in their adjoining restaurant. I bought some whitefish and trout at Peterson’s. As soon as I got home, I surfed the internet for ideas and came across this wonderful Pistachio Pesto Crusted Salmon. After I read the recipe, I was eager to give it a try. The pistachio pesto complemented the delicate whitefish beautifully. I served the fish with Roasted Cauliflower and Baked Spicy Garlic Potato Wedges. Everyone agreed it was a fabulous meal! This Pistachio Pesto Crusted Whitefish recipe was adapted from Citronlimette. Halibut, cod, tilapia, or sole may be used in place of whitefish. Do give it a try. You will not be disappointed. My friend, Marie Poulin is a Personal Chef in Sarasota, Florida. She has created and tested a great number of recipes and favors fresh, seasonal, and local ingredients. Please visit her blog, Citronlimette for more vibrant, delicious, and healthy recipes. Looks yummy! I like the option of using rice cereal, especially since there are four (!) boxes sitting in my pantry (you see, they had a sale …). So any suggestion that’s not rice crispy treats is very welcome! Rice cereals are a great “breadcrumbs” option. I actually like it better than regular breadcrumbs. Biren, Thank you so much for trying my recipe. Your fish looks delicious and your pictures are amazing! You are such a wonderful friend. Glad we had the chance to connect on Facebook. Thanks for your wonderful recipe, Marie! I will definitely be making this again as it was so tasty and delicious. What a great looking plate of food. The pistachio pesto on the white fish sounds wonderful. The pistachio pesto really was wonderful, thanks to Marie of Citronlimette. The recipe is a keeper! This looks like a super fast way to cook fish! Very creative to use pistachio with basil and parmesan. My kids have developed a liking to your rice crispy topping – I don’t even bother crushing them as the kids enjoyed the look and taste of the original size… Definitely will try to make these soon! I spent several years on the Keweenaw Peninsula in my very early years, and I have never forgotten the wonderful taste of smoked fish, or the wonderful snow sculptures at Michigan Tech. Thank you for a loving reminder. I am glad this post brought back fond memories for you, Liese. 🙂 Keweenaw Peninsula is a beautiful place and I would go back again sometime.